Grammy award winner, Adkins Adele and her husband, Simon Konecki, have separated, three years after their marriage. Konecki, who is the water charity executive, and the Adele met in 2011 and later married five years later; a courtship that produced a son. The British singer has chattered several records in the industry which has made experts in the industry rate her as the most successful singer-songwriters of all time. Adele’s representative disclosed their separation yesterday admitting that the 30 year old singer and her husband, before the breakup, agreed to raise the child together. Adele shot to fame in 2008 with her debut album ’19’, lauded for its combination of soulful vocals and confessional lyrics. Why do humans sleep? A new study by scientists at the Bar-Ilan University in Ramat-Gan, Israel, has unearthed a key factor that may lie at the center of sleep’s indispensability: its restorative effect on individual brain cells. The team, which Prof. Lior Appelbaum led, reports its new findings in a study paper that appears in the journal Nature Communications. In this study, the investigators turned to zebrafish, which scientists often use in research because they are surprisingly similar to humans. In fact, approximately 70 percent of human genes also occur in this freshwater species. Using 3D time-lapse imaging, the scientists looked at the effects of sleep on a microscale and observed how it affected single neurons, or brain cells. The high-resolution technology allowed Applebaum and team to follow the movement of DNA and proteins within brain cells. They found that during sleep, individual neurons were able to perform maintenance work on the nucleus, the central element of each cell, which encloses most of that cell’s genetic material. “Despite the risk of reduced awareness to the environment, animals — ranging from jellyfish to zebrafish to humans — have to sleep to allow their neurons to perform efficient DNA maintenance, and this is possibly the reason why sleep has evolved and is so conserved in the animal kingdom,” Applebaum said. When the nucleus begins to deteriorate, the DNA information it contains also becomes damaged, and this can lead to aging, disease, and poor overall functioning in an organ or tissue. During sleep, the researchers explain, the neurons have an opportunity to recover from the stress they accumulated during the day and “fix” any damage they may have sustained. “Roads accumulate wear and tear, especially during daytime rush hours, and it is most convenient and efficient to fix them at night, when there is light traffic,” he explains. Since this process is so vital to ensuring that the brain stays healthy, this can explain why animals — humans included — are willing to invest so much time in sleep, despite the risks it may expose them to in nature. “We’ve found a causal link between sleep, chromosome dynamics, neuronal activity, and DNA damage and repair with direct physiological relevance to the entire organism,” explains Prof. Appelbaum. There is a fire outbreak at Bolaji Omupo street, Pedro, Shomolu, Lagos state. A pure water factory, Bamas water caught fire this evening , the cause of the fire is currently unknown. There are emergency responders on ground trying to salvage the situation and stop it from spreading to a fuel station nearby . While many globally were settling for Chicken and Pork meat to celebrate the yuletide, Indians have accepted to settle for Rats during the season. Freshly-caught rat is at the top of the menu for crowds flocking to a market in northeastern India that specialises in rodents from local fields. A kilogramme (2.2 pounds) of rat meat, which is considered a delicacy, sells for about $2.8— as much as for chicken and pork. “We put traps in the fields as the rats eat people’s paddy,” Samba Soren, a rat vendor at Kumarikata said. Sunday is often the most challenging day of the week. As some people say, anticipation can be worse than the real thing—which, in this case, is the week ahead. On Saturday, you’re all gung ho about the weekend, but as the hours creep further and further into Sunday, you get a case of what’s been dubbed “the Sunday scaries.” What do you have going on this coming week? Are you ready? How can you prepare yourself for the five days of work ahead? What we really should be doing with those Sunday hours is savouring them, not wishing them away. Since you don’t have to waste any more precious time, we’ve rounded up the 37 best things to do on a Sunday to start the week off right. Print out this list (or save it to your phone) and cross activities off as you go. 2. Prep a frittata to have for breakfast all week long. We’re partial to this decadent recipe, courtesy of Athena Calderone. 3. Join book club. So get reading. 4. Browse pet-adoption websites. Even if you aren’t ready to get one (or you already have one), it’ll put a smile on your face. 5. Look at your friends’ (and friends of friends’) wedding registries. Why? Because it’s pure fun. 7. Download the Shapr app. This program connects you with people in your business field, so go in with the goal of networking with two new individuals this month. It’s kind of like a dating app, but for work! 8. Take an online calligraphy class. We’re partial to Laura Hooper Calligraphy. Those swirls! 9. Download the soundtrack from your favorite show, movie, or musical. Then sing along to the whole thing. Is anyone else on Assurance by Davido? 12. Do an edit of your closet. You’ll feel so much better knowing what you have and what you may need. And don’t be shy—toss/donate anything that’s worn, doesn’t fit, or that you won’t ever wear again. 14. Buy tickets to a charity event. Browse Facebook to find fun fundraisers coming up. Then pick out which dress you’ll wear/rent. Now you’ve got something to look forward to while giving back. 15. Explore a personalized daily vitamin plan, These custom, premade vitamin/supplement packs are perfect for people on the go. 16. Browse Thumbtack to find a new hobby. From voice lessons to dance instruction to the basics of tennis, you’ll find an expert to teach you anything that interests you (be sure to read the reviews). 17. Download a new book from the public library database onto your e-reader. Did you know that most public libraries let you borrow e-books free of charge (with a library card, of course)? Be sure to see if there is a section of librarians’ picks; it usually has some great under-the-radar selections. 19. Put on some teeth-whitening strips. Who doesn’t want more of a reason to smile? Distract yourself from the weird feeling by watching some aspiring musicians do celebrity covers on YouTube. 24. Make a five-year plan. Who else has received the dreaded interview question, What is your five-year plan? Make one list that’s career-focused and another that revolves around your personal life. 25. Gather your change and roll it. Or just gather it! Some banks like Bank of America will actually send it out unrolled and deposit it in your account with no fees (if you’re a cardholder, of course). 26. Scroll through Pinterest for travel-destination. Japan? Hawaii? Panama? Which destination will you save for your next trip? 28. Clean your makeup brushes. Do you know how dirty they actually get? If you’re not a fan of cleaning them by hand, this cool contraption cleans up to 12 brushes at once. 30. Search for a friend’s birthday gift months in advance. It will guarantee you’ll get them something just as special as they are. 31. Stretch. Lay out your yoga mat and just do some light stretching. You’ll instantly feel more zen. 32. Treat yourself to fro-yo at your favorite local spot. Splurge on some extra toppings, because you’re worth it. 33. Arrange a pretty bouquet. Plus, here’s how to do it with flowers from the grocery store. 35. Scroll through old pictures of you and your friends. Is there anything better than a trip down memory lane? You’ll be occupied for hours, plus you may even be inspired to print some photos! 36. Write yourself inspirational notes to scatter throughout your home. Everyone can use some words of encouragement! This story was originally published on April 16, 2017 by M. Guerrere, and has since been updated. Adaeze and Matu tied knot during their traditional wedding held at Bride father’s home, CharlyBoy Boulevard in Gwarimpa Abuja. The marriage rite was followed by a grand reception at the popular Evelyn Event Centre,which hosted Celebrities both from within and outside the entertainment Industry. However, CharlyBoy expressed delight and just as wished the couple prosperous life . “I advise them to build friendship and deeper love for each other as husband and wife,”he said. The weeding was attended by government functionaries and heads of organisations, including a former minister of Education, Oby Ezekwesili, who was in attendance. Veteran Nollywood actors Francis Duru and Nkem Owoh were the Masters of Ceremony. Could ‘The Wedding Party 2- Destination Dubia’ make another history at the cinema? ‘The wedding Party 2- Destination Dubai’ a film by Elfike Collectives, had its grand world premiere at the Eko Hotel & Suites on December 10, 2017. The Arabian themed event which was attended by celebrities as well as members of the public in different arrays of Arabian outfits including the old and new cast of the movie like Banky W, Adesua Etomi, Richard Mofe Damijo, Sola Shobowale among others. Yesterday, December 15, the movie which continued with another wedding, this time held in Dubai, was had it official opening at the in the cinemas in Nigeria. Movie critics are however of the opinion whether ‘The Wedding Party 2-Destination Dubia’ make or surpass ‘The Wedding Party 1’ which was released in 2016, in term of revenue. ‘Though, ‘‘The Wedding Party 2-Destination Dubia’ is said to have been a sold out a month before it was premiere in Nigeria, the question however is if the part 2 can break the ground record of its part one of N453,050,000 (Four hundred and Fifty Three million) which, is currently the highest grossing movie in Nigeria. The Wedding Party 2- Destination Dubai, as an addition of new cast while still retaining it previous cast. The sequel to the previous movies tells the love story of the romance between Nonso Onwuka (Enyinna Nwigwe ) and Deirdre (Daniella Down). Nonso while on a date with Dierdre proposed by accident and this set a chain of event between the families. The family of the bride, who are upper-crust British family were against the match as well as the Nigerian parent of Nonso. Bitterleaf soup is one of the most traditional soups in Nigeria. 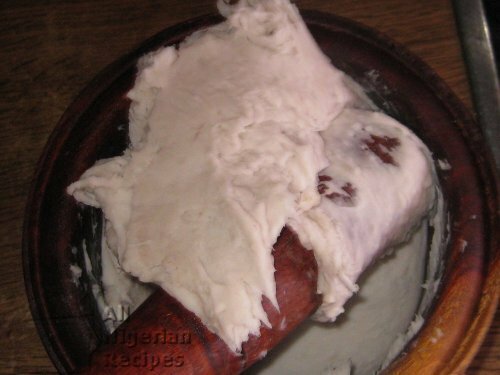 It is native to the Igbos of Eastern Nigeria.